Poppy McVie wants nothing more than to protect animals. 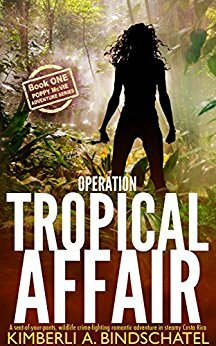 Armed with a shiny new U.S. Wildlife Service badge, she’s plucked from training and sent undercover to Costa Rica to play the wife of seasoned Agent Dalton who wants her to look pretty and keep her mouth shut. Review: Poppy McVie is passionate about protecting animals. Described as a 24-year old Pippy Longstocking, she is a new agent for US Wildlife Service in Michigan when she's suddenly sent to Costa Rica for an undercover assignment. The good? Bindshatel is clearly passionate about animals and I was very interested in learning about the black market of wildlife trade. I found Poppy and Dalton's interactions funny at times. The not so good? Poppy was not even remotely believable as an undercover agent and her personality was grating most of the time. Her inability to follow rules, protocols and repeated poor decision making, yet being a know-it-all the entire time...very frustrating to read. Even though she solved the crime, in no universe do I see her being retained for undercover work. Overall-not my favorite book, but very informative about the animal trade.